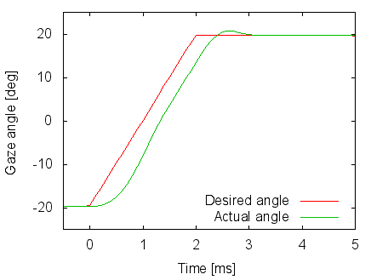 We developed a high-speed gaze control system to achieve a millisecond-order pan/tilt camera. We named this system "Saccade Mirror." A pan/tilt camera, which can control the gaze direction, is useful for observing moving objects for supervision, inspections, and so on. A high-speed image processor that can both image and process in real time every 1-ms cycle has recently been developed. If this image processor were applied to a pan/tilt camera, it would enable observation of extremely dynamic objects, such as flying birds, balls in sports games, and so on. However, to control the camera's gaze with millisecond order in real time is difficult. The main reason is the method of controlling the gaze. A general pan/tilt camera is mounted on a rotational base with two-axis actuators. The actuators must control both the base and the camera. For millisecond-order control, the weight of the rotating parts must be reduced as much as possible. In our method, the camera is fixed and Saccade Mirror is installed next to the camera. Saccade Mirror controls the camera's gaze optically using two-axis rotational light mirrors. Saccade Mirror is composed of two important parts, two galvanometer mirrors and pupil shift lenses. A facial size of a galvanometer mirror is small because it is usually used for scanning laser. We cannot expect a wide angle of view if only galvanometer mirrors are used. Pupil shift lenses, however, make an angle of view wider with shifting the camera pupil to near the mirrors. The prototype of Saccade Mirror can be applied up to approximately 30 deg. We measured its response time and ascertained it was mere 3.5 ms even if scanning 40 deg, the widest angle, for both pan and tilt. The result of tilt-scanning could be obtained as well as that of pan-scanning.